Infront Sports & Media, media and marketing partner of the European Handball Federation for the EHF EUROs, has secured a new Official Sponsorship for the 2014 Men’s event. The Local Organising Committee of the 2015 Men’s Handball World Championship in Qatar will promote its event through the flagship platform in European handball. The Men’s EHF EURO 2014 will be held in Denmark (Aalborg, Arhus, Herning and Copenhagen) from 12 to 26 January. As an Official Sponsor of the 2014 Men’s EHF EURO, the 24th Men’s Handball World Championship will receive comprehensive advertising exposure in camera view across state-of-the-art LED boards, static boards and floor signage, complemented by website presence. In addition, the Qatar 2015 Local Organising Committee will receive extensive promotion and presentation opportunities at the EHF EURO venues, in order to engage fans and draw awareness to next year’s handball highlight, carried out exactly one year later – from 17 January to 1 February 2015. The sponsorship agreement has been facilitated by EHF Marketing, marketing arm of the European Handball Federation. 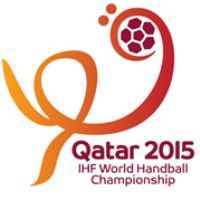 The 2015 IHF Men's Senior World Championship will be the 24th edition of the event and will be held for the first time in Qatar – carried out in one city, Doha and in four different venues. A total of twenty-four teams will participate including Qatar as hosts and Spain as world champions, along with 22 of the best teams from continental and European qualification tournaments.